One of our favorite blogs, Wedding Chicks, featured our all greenery bouquet for their "happy hour" inspiration. This bouquet can be such a fun alternative for bridesmaids or even the bride looking for something a little different. I love how it looks with a bright colored dress and it would be so perfect for an outdoor wedding in the forest or woods! This bouquet included umbrella fern, mint, buplureum, veronica, fern curls, and explosion grass. Photo by Mirelle Carmichael Photography. And make sure to head over to the Wedding Chicks blog for more inspiration for your wedding! Today we were thrilled to see this Retro Pastel Inspiration Shoot featured on the one and only Style Me Pretty. The beautiful ladies at LovelyFest Event Design asked us to design the flowers for this amazing theme and as you'll see it is so refreshing and fun! From the florals, to the funfetti, to the cotton candy cart and more the overall design was beautifully done. Thank you and great job to the amazing team of vendors. Kelsea Holder Photography did a beautiful job on the photos, they just look so soft and heavenly! How perfect would it be to have a cotton candy cart at your wedding? Love this Bon Puf , what a great service! For the groom we put a pretty pastel pink ranunculus, with rice flower and dusty miller foliage, together for his boutonniere. And love this mint bow-tie! And what's a party without cake?? And since we're talking cake have you seen the awesome stuff that Paper Cake Events does? I have a new found cake crush, seriously gorgeous and delicious work! We were so thrilled to be a part of this beautiful California inspired wedding shoot that was featured on Green Wedding Shoes. The shoot took place at a beautiful new venue on the Central Coast in the heart of the Edna Valley Wine Country, called Biddle Ranch Vineyard. I feel blessed to be a part of this great team of vendors, which included the leading ladies of Karson Butler Events, who created the overall design and brought the shoot together to launch their new California office. It was also such a joy to work with the talented Jodi Miller Photography, who did an amazing job of capturing our CA scenery and light so perfectly! 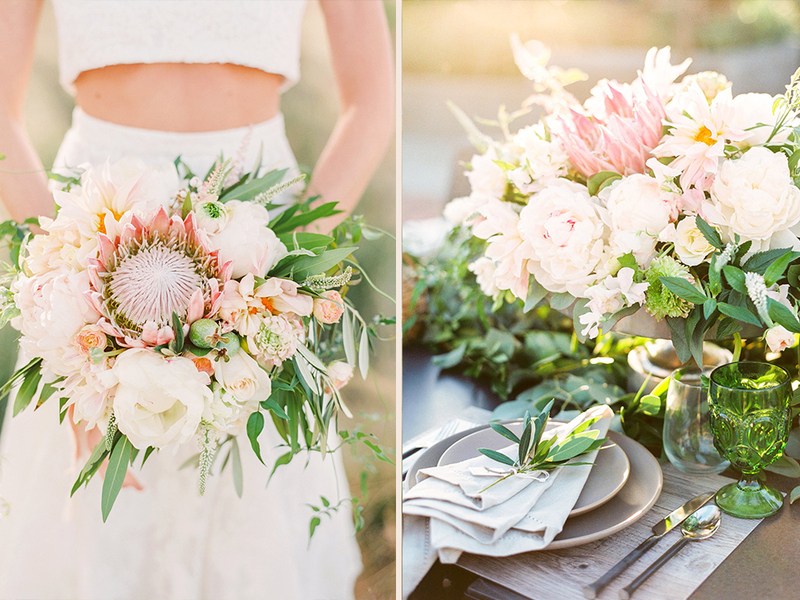 The bouquet was created with the always stunning king protea, along with peonies, ranunculus, roses, olive foliages and touches of organic materials to create a light, whimsical feel to the soft and romantic colors. There's even a touch of pineapple guava's in there, can you spot them?! The centerpieces were created on the always impacting Fuse Trays we have available for rental and then the table was laid with a plush greenery garland of olive branches, silver dollar eucalyptus and bay leaves! The dresses were stunning pieces by Pas de Deux Bridal and the beautiful model's hair and makeup was done by Paris Courtland of The Queen's Bees. The amazing ceremony was so fun and refreshing with a new style of cowhide runners and theatre style seating provided by Found Vintage Rentals! "21 Prettiest Floral Ideas from Noonan's Wine Country Designs"
"Katie Noonan, owner of Noonan’s Wine Country Designs, is giving us serious inspiration today. She has a modern and fresh design style making each floral piece a complete work of art. Just to give you a snapshot of her work, check out these 21 floral wedding ideas straight from the hands of an artist." It's always such a pleasure to see our work shared with others, so thank you MOD Wedding! This wedding was by far one of the most challenging but rewarding weddings of my career. As a florist we should know not to say "yes" to some things and using cut bougainvillea in one of the hottest locations, Paso Robles, CA, during August, should have been a clear "NO" but for some reason I did say yes, probably because I never like to say no, and in this case it paid off! I may have scooped out every bougainvillea bush growing in San Luis Obispo county, tested cut bougainvillea in fresh water, oasis and had sleepless nights over if it was going to wilt or not, but after this wedding was complete and I saw the images by the talented Jake and Necia Photography, it actually inspired me and reminded me why I love my job. 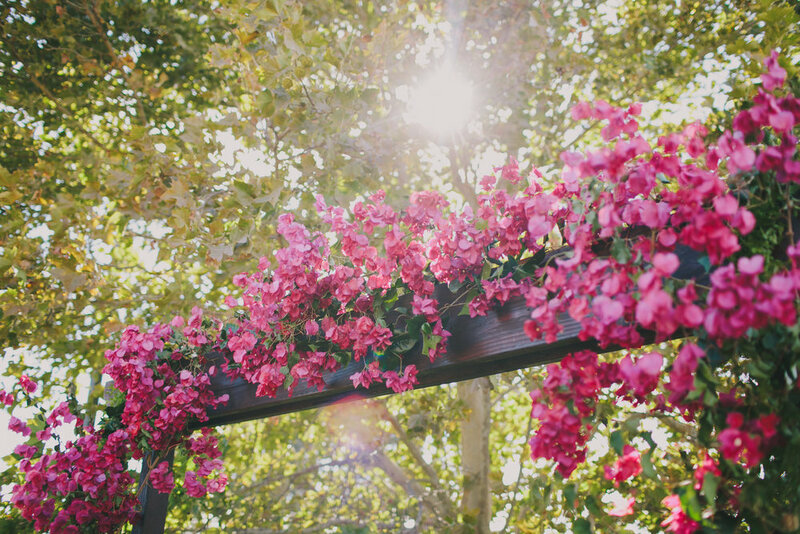 The inspiration of bougainvillea came from the brides hometown of San Diego, where it beautifully grows wild. I loved using the vibrant hues of this plant and loved bouncing the hints of purple and green off the fuchsia roses and anemones. And the mint foliage was the perfect accent and smelled great as well! The centerpieces were created with candelabras trailing with bougainvillea and a gathering of small arrangements at the base. One of my favorite accents of this wedding was adorning the bride and groom chairs with the trailing bougainvillea. The great team of Central Coast vendors for this wedding was lead by the girls at Touch of Style Events, with photography by Jake and Necia ,Catering from Trumpet Vine Catering, Lighting and DJ by Kramer Events, Venue Location Cellars 360, Paso Robles, CA and Calligraphy and Stationary from Umbrella Tree Designs.